Minnesota is known for its abundance of professional sports teams. Specifically, for their deep and unconditional love of the Minnesota Vikings and Minnesota Wild. Sports are at the heart of Minnesota’s passions, and the U.S. Bank Stadium is like a gift from the heavens. This stadium allows the state to host some of the nation’s most watched sporting events. Since February 4th is the first Super Bowl in the U.S. Bank Stadium, we thought we’d shed some light on all of the sports action you at the U.S. Bank Stadium this year and in years to follow. But first, here’s what makes U.S. Bank Stadium so special. June 17, 2016, the U.S. Bank Stadium opened its doors to the public and welcomed the Vikings to their new home. Previously, the Vikings played in the Hubert H. Humphrey Metrodome. However, the Metrodome closed in 2013. During construction of U.S. Bank Stadium, the Minnesota Vikings competed in the TCF Bank Stadium at the University of Minnesota. This two-season wait was well worth it for the Vikings. The stadium is a glass beauty that reflects the skyline of Minneapolis. The facility also boasts a fixed roof that allows it to be used all year round, no matter the winter conditions. As a matter of fact, the stadium’s roof is actually the largest roof made from fluorine-based clear plastic in North America. This technology allows as much natural light in as possible. U.S. Bank Stadium also hold the world record for the five largest pivoting glass doors. vFor large events, the seating capacity of the facility can be expanded to 73,000, making it an ideal venue for professional sporting events. That’s why it will be used for 2018 Super Bowl and several other marquee events. This year, U.S. Bank Stadium is the host for the 2018 National Football League’s Super Bowl. Unfortunately, the Minnesota Vikings don’t get the home field advantage. Instead the New England Patriots and Philadelphia Eagles will go head to head on Minnesota turf. It’s possible that Super Bowl 52 will go down as the coldest Super Bowl in NFL history - thankfully it is indoors! In 2018, U.S. Bank Stadium will host one of the largest extreme sporting events, the X Games by ESPN. This action-packed event will take place over a long weekend in July, from the 19th to the 22nd. The X Games is an event like no other in Minnesota. While many Minnesotans love football and hockey, the X Games include concerts, freestyle BMX, skateboarding, and much more. To view highlights from last year’s event, check out this reel. Every Spring, U.S. Bank Stadium hosts several college baseball games. While spring usually means outdoors in most places, that’s not always the case in Minnesota. Weather can be extremely detrimental to spring sports like baseball, so the indoor stadium is ideal. Games start in February and run through March 30th. With admission at only $5.00 a ticket, these games are some of the most affordable sporting events held at U.S. Bank Stadium. The NCAA chose U.S. Bank Stadium to host it’s 2019 Division I Men’s Final Four. The last time the Final Four made an appearance in Minnesota was at the Metrodome in 2001. This marks the second time Minneapolis will be able to crown a national champion for Division I Men’s Basketball. The decision to host the 2019 Final Four was made before the stadium was even finished. 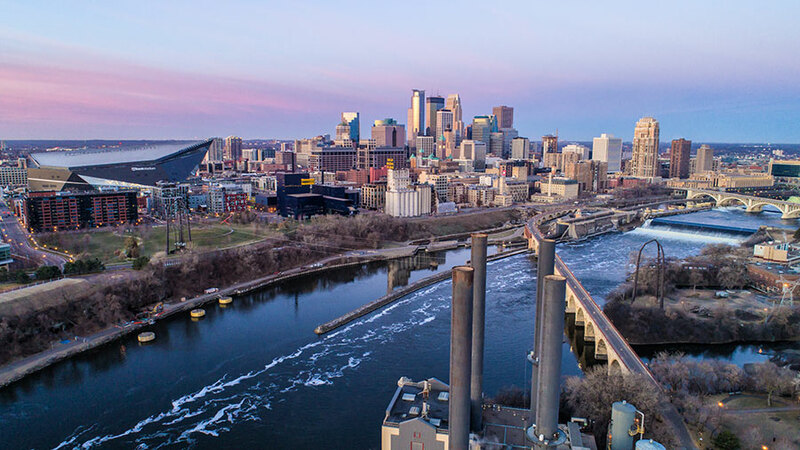 Aside from the architecture of U.S. Bank Stadium, Minnesota’s infrastructure had a huge influence on the decision to host the NCAA Final Four in Minneapolis. The 2020 NCAA Division I Wrestling Championship is another marquee sporting event that is scheduled to be hosted at U.S. Bank Stadium. The last time this event landed in Minnesota was back in 1996. U.S. Bank Stadium will be the largest venue to host this particular wrestling championship. It’s hard to believe that U.S. Bank Stadium is only one of many sporting facilities within the walls of the Twin Cities. Many of the tickets for these events are available on U.S. Bank Stadium’s website or for a discount on reputable deal sites. Next to U.S. Bank Stadium, the Target Center also hosts several prestigious NCAA Championships. That said, it’s safe to say the Twin Cities will continue to be a target host for many years to come. Minnesota is the place to be for sports fanatics of all kinds. Residents can find sports at all levels of play, including high school, college, and professional teams. Sports enthusiasts will find themselves right at home with year-round sporting events, regardless of the weather conditions.